Last Saturday afternoon, a small group of us were lucky to attend a wine tasting at Bistrot Lepic, courtesy of managing partner Cyrille Brenac. 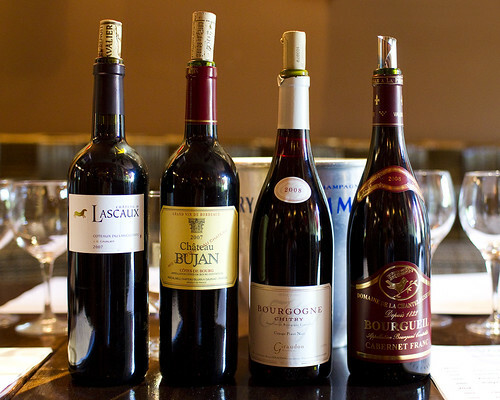 Tucked into a cosy sun-drenched room at the back of the upstairs wine bar, far from the chaos of the crowds on Embassy Row, fellow WLDC author Max and I joined a few readers to learn more about French wine from one of the top authorities in the city. 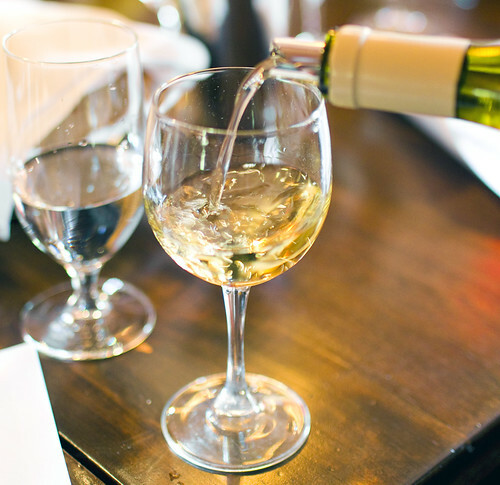 Sampling eight wines in two hours – four whites and four reds from various regions in France – we came away more comfortable on the subject and eager to learn more. Throughout, I was amazed by the vast knowledge Cyrille shared and though I’ll try to hit the highlights, I can’t hope to replicate it. Luckily, every Tuesday evening from 6pm to 9pm, you can attend a complimentary wine tasting there yourself and I highly recommend it. 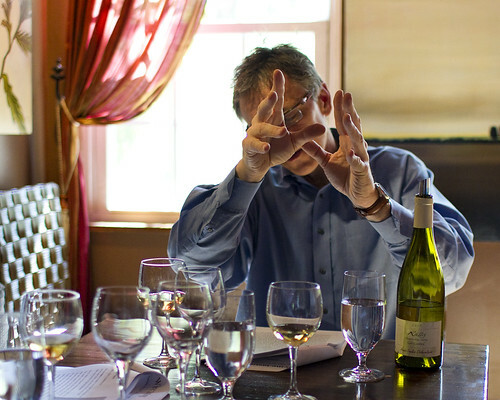 So, where to start… How about the mystery behind how you actually taste wine? What are you supposed to do when the glass is placed before you? What about that pesky cork? It comes down to three words – Look, Sniff, and Sip. Pick up your glass first (that’s easy enough!) and gently twirl it, watching the edge of the liquid. The more it “cries” against the glass, the more alcohol content it has. Then look at the color. A darker color means it was matured in oak barrels, a lighter in metallic barrel. Then “put your big nose inside it and breathe it in,” as Cyrille quipped, “you can close your eyes and think about it.” This is where we usually get self-conscious tasting wine but it really does help to take a minute and try to discern different scents – honey, citrus, etc. – before diving in to taste. In a proper wine tasting, you don’t have to swallow, just “turn it around in your mouth and get your senses excited.” Then once you’ve got an idea of what the wine’s about and how your particular taste buds have reacted, you can discreetly spit it out. I was surprised how much this process, which I never really gave much care to, really helped me understand each wine, and in future I’ll give it more thought when I order wine. Cyrille also explained the purpose behind the waiter putting the cork before you on the table is because sadly there can be wine fraud, so you should just pick up the cork and look at the imprint to make sure it matches the bottle. Cyrille also took us on a comprehensive journey through a map of France, explaining the many different regions and which regions produced which wines. For example, in Burgundy the whites are produced from Chardonnay grapes and the reds from Pinot Noir and Gamay. In Bordeaux, their famous reds are made by combining many varietals (up to two or more, in some cases quite a lot more) together to make the perfect blend. Whites in Sancerre are made from Sauvignon blanc grapes. You could really go a bit mad delving into it all, so my advice is to start with your favorite region or grape and concentrate on learning as much as you can first, instead of trying to get smart on the entire country’s wine output! Labels can also be intimidating to Americans as our wines are always labeled with the grape the wine was made from – but in France, labels are indicative to each region. For example, in Bordeaux the identity of the wine is associated with chateaux, not with the land or town, as in other regions. Really the best way to get over French Label Fear is to spend some time with a wine map familiarizing yourself with the country. Better yet, if you have the chance, Cyrille recommended a trip to France, renting a car and doing your own winery tour! The varying climates, from cold to hot and mild in between, combined with the different landscapes (terroir) he described like flat or hilly, all contribute to making French wine successful. We tasted eight wines in all, carefully attending to the wine tasting process of look, sniff, and sip each time. Aided by bar manager Ted Putala, we tried to ascertain the different flavors like citrus, honey, minerals, and the varying viscosity. The four whites were: Jurancon, Domaine de Castera 2009; Saint Bris, Caves de Bailly, Saugvignon Blanc 2008; Alsace, Pinot Gris Reserve, Trimbach 2005; Rully Les Cailloux, Sophie Debavelaere 2005. Of these my favorite was the Trimbach, as I love Alsatian Pinot Gris and its fruity creaminess that still manages to be dry and not a cloying sweet wine at all. The four reds were: Chitry, Domaine Giraudon 2007; Bourgueil, Domaine de la Chateleuserie 2008; Coteaux de Languedoc, Chateau de Lascaux 2007; Cotes de Bourg, Chateau Bujan 2007. Of these I absolutely loved the peppery lusciousness of the Lascaux, which was a blend of Syrah, Granache and Mourvedre and made me fantasize about pairing it with a nice bloody steak. We ended the afternoon extremely inspired to continue learning more about French wine, warmed by our host’s generosity and the care he took to help us over the intimidation factor. I’ll definitely be back for dinner and a bottle (or two!). As for that vacation touring French wineries, well, you can be sure it’s on my menu. Many thanks to managing partner Cyrille Brenac of Bistrot Lepic for hosting the wine tasting and to bar manager Ted Putala for joining us. Thanks to Lindley Thornburg for making the introduction, to our readers who attended, and to Max Cook for fantastic photographs.